Imagine this. You’re all set to view your favorite show on your brand new, state of the art fancy TV but you want to watch it using headphones. What headphones do you use? It wouldn’t make sense to use a $10 pair of headphones with your expensive TV, right? You’d need truly great quality wireless headphones for your TV in order to really enjoy the viewing experience! In this article, we’ve rounded up and reviewed the best Wireless headphones for TV. The headphones included on this list come from top audio contenders such as Sennheiser, Sony, Bose, and a few other new brands on the scene. All the TV headphones mentioned here have been thoroughly reviewed and are a safe bet. You’ll find the pros and cons listed for each of them allowing you to choose the best for yourself. When it comes to headphones, Sennheiser is probably the best in the business. And the RS120 – from their entry-level series – is truly exceptional in every way. Don’t let the price tag fool you either! Intense testing proves these TV headphones to be pretty darn good. Low cost, powerful specifications, and great out of the box design – all of these excellent features have earned these headphones the first spot on this list. We think these can be perfect for anyone looking for a budget oriented pair of TV headphones. Comes with a wireless transmitter which also acts as a wireless charging dock – just place your headphones over it for a little juice. Offers a connectivity range of up to 100 meters allowing you to maintain a reasonable distance from the TV that doesn’t affect your eyes. Light Weight Radio Frequency makes it the perfect headphones to use with your TV or with Hifi Audio Devices. Interference free reception allows wireless sound waves to pass through walls and ceilings. Open back design with excellent sound experience. Comes with Tune in and volume control buttons on top of the drivers. 20 hours of average battery life. These headphones certainly give you a bang for your buck in our opinion. Equipped with powerful features all that comes at a very low price tag, makes them the best choice for customers. In terms of build functionality, the right ear-cup slides out providing access to the battery area for the battery that comes with the headphones. That is the very first thing you need to do when you get them. A total of 3 functions are present on the ear-cups themselves. On the left, you have the on and off switch, while on the right, you get two options: one to adjust the volume and the second one to tune in the transmission. The sides of the headphones are adjustable with an ample amount of comfortable padding on top. The covering on the ear-cups is also very smooth and feels comfortable on the ears. The wireless technology is exceptionally great, and it truly offers you connectivity of up to 300 feet. The battery installed does a great job providing a range of up to 20 hours of operation, which means you can easily expect it to last up to 2-3 days on a single charge assuming that you don’t spend more than 5 hours a day watching TV. These are open back headphones, a design that allows the sounds to pass freely and surrounding sounds are easily identifiable. While we can’t refer to it as an ambient sound technology, it does create a good balance between external and internal sounds. Above all, the headphones are very lightweight, barely allowing you to feel that you’ve got something on. The Sennheiser RS120 also comes with a multi-connectivity option that allows users to connect up to 100 headphones (HDR 120) to the transmitter for simultaneous listening. Now, this is something that truly blows our mind. 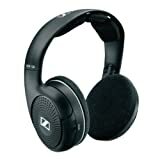 While there are indeed other headphones with a similar feature (most of the TV headphones from Sennheiser allow multiple connectivities) the option to connect up to 100 headphones is only presently offered by the RS120. The transmitter that comes along with the Sennheiser RS120 is compatible with all devices that come with analog input. These include televisions, laptops, tablets, computers and cell phones with a standard 3.5mm jack or 6.5mm headphone sockets or RCA jacks. This implies that you can easily use these headphones with your mobile, laptop, and tablet. Multiple headphones connectivity up to a total of 100 headphones (HDR 120). Up to 300 feet of insane wireless connectivity. Interference-free channels for clear reception. Comfortable padding on both the band and ear-cups. 20 hours of exceptional battery range on a single charge. The RS120 can most certainly save you a few bucks if you decide to go for it. From battery life to connectivity range, to the exclusive multiple connectivity option, the RS120 makes it clear why it is the top contender on this list! 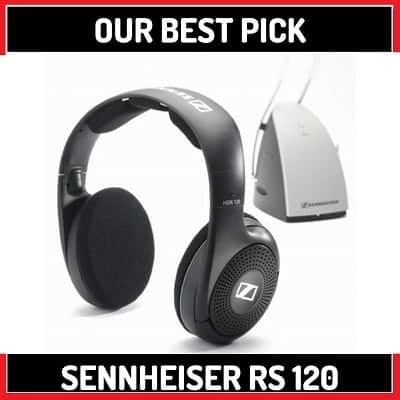 Sennheiser RS175 headphones are another great addition to the RS series in the form of a closed-back over the ear, circumaural headphones with some brilliant features and great build quality. If you are in the market for a pair of extraordinary or advanced headphones, the RS175 comes highly recommended by us. Sennheiser started with the RS110 and went up higher both in terms of features and quality. At the end of the line, we do have the RS195 but we recommend the RS175 over them as we find the RS175 to be more superior when compared to the RS195 and the RS185 in terms of overall performance. The RS series is the premium line from Sennheiser that comes jam-packed with some really advanced features. Each model in the RS series is quite different from each other and we ultimately chose this model because we believe it has the best combination of sound, performance, specifications, and cost. Closed back design for better bass experience and no sound leakage. Virtual Surround modes and bass boost options to customize listening as per the user’s needs. Options for Both Digital and Analog output in the Transmitter. Easy Connection to other devices like Mobile Phones and Laptops by way of the 3.5mm audio jack. Transmitter supports simultaneous connection up to 2 pairs of headphones. Buttons on top for bass control, audio modes, and other general controls. Cushion Pads on drivers and headbands for extreme comfort. The RS series from Sennheiser is the best series of wireless TV headphones available, and the RS175 is a great addition to it. With a high connectivity range on these TV headphones, you can easily enjoy your entertainment at a comfortable distance from the TV. Want to listen to music while lying in bed? Not a problem with the RS175. The headphones sport a few new options not present on the RS120 model mentioned above. With the RS175, you now have the options to change virtual surround modes and bass controls, with the control buttons present on the driver itself allowing you to turn on the features when you need to. They are multi-purpose headphones which can be used with any device having an analog output [Left, Right RCA or 3.55 audio port], which makes them super compatible with smartphones and tablets. The design and build quality are top notches, with a focus on the comfort level being petty apparent. They come with cushion pads on both drivers and headbands for better comfort to ears. You also get an excellent battery life of 18 hours on this pair. The design on the RS175 is closed back and over the ear, which ensures absolutely no sound leakage from the headphones, which is a plus when you’re surrounded by other people and do not want to disturb them. The over the ear design also works great for noise isolation, ensuring you are not bothered by external noises as well. Up to 100m of Connectivity/Delivery range. Transmitter Supports both Analog and Digital inputs. Superior comfort and sound quality. Dedicated Bass and Virtual Surround Sound modes. The price tag on the RS175 is set in the mid-range making it a good investment, considering the power packed nature of the headphones. You can purchase them either as a solo pair or as a pack of 2 depending on your needs and preferences. The overall sound and bass performance on the RS175 is extraordinary and the ability to control the different audio modes through physical buttons is certainly another plus point. Sony has been on the market for a very long time and needless to say, it is one of the most trusted brands when it comes to audio devices. Whether it is headphones, speakers or music systems on smartphones, the quality is always excellent. Today we are reviewing the great MDRRF985RK, which is one of the best and most cost-effective wireless headphones for TV from Sony. For a lot of people, these might be the best TV headphones while for others it may not be quite the right choice. With that said, let's dive right into the specifications. 40mm drivers for better ear covering and no sound leakage. 900 MHz frequency for wireless listening. Equipped with Noise reduction technology so that you can focus on what you’re listening to. Cushion padded headband for extreme comfort. Easy setup, just connect your RF receptor to TV and you are good to go. High connectivity range up to 150 feet. An unlimited number of headphones connectivity with one base/receiver. Excellent battery range of more than one whole day. Equipped with standard 40mm drivers, the headphones may feel a little bulky to some users although it must be kept in mind that the large drivers favor the noise reduction technology that comes along with the headphones. The more the ears are covered, the better the effect of the noise reduction technology. If noise reduction is your utmost priority, then these wireless TV headphones would work great, but if you‘re looking for all-round perfection, you might come away a little disappointed. The build quality on the headphones is certainly not the best around although the matte black finish does give them a great look. However, looking at the price tag, this single minor issue can be easy to overlook. The headphones offer up an excellent connectivity range of 50m/150feet, with zero interference issues. Setting it up with any TV or FM radio is dead easy, plus the 900 MHz frequency offers up great clarity and quality of sound. It really is quite difficult to have anything negative to say about that aspect. If you’ve had trouble with battery life on your previous headphones, it most certainly is not going to be an issue here as the average battery life on these is about 24 hours, which is pretty great. Now, while the build quality on the outside might not be the best, the comfort level, however, on the inside of these earphones is quite good. The cushion covering and padding on the ear-cups is soft and feels very comfortable. Moving onto controls, you get various physical controls on the bottom of both the drivers. There is an on and off switch and on the right driver and tuning and volume controls on the left. The good thing about volume controller is that it also comes with fixed different level from 1 to 10, so In case you have some preferred volume level you can set that up right away. And finally, last but most certainly not least, the sound quality is excellent. The bass is great and is clearly felt while watching movies, especially if an action scene kicks in. Expressive sound system and bass quality. Automatic tuning for the optimum signal reception. Comfortable cushion padding on the band and the ear-cups. Excellent battery life of up to 25 hours on a single charge. Could be a little bit bulky for a few users. Not the best overall build quality. These headphones are one of the lowest priced wireless TV headphones from Sony and perform really well in all the technical aspects. So if you’re on the hunt for a pair that doesn’t compromise in terms of features and would also like to stay under your budget, then there would be a great deal for you with the amazing sound quality and great battery life. Bose is synonym with great sound quality and product build. The Sound Link 2, while a little on the expensive side, is to put it plainly, perfect. Deep immersive sound, best in class EQ, and a neat design tick all the right checkboxes. 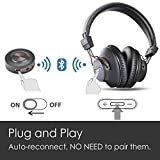 Use it with your TV or with your phone; the advanced Bluetooth technology makes it easy to use these headphones with all presently available music devices. Bose has been a giant in the market for a very long time and is well known for producing excellent products such as headphones and speakers and while their products to tend to run on the more expensive side, comparing the quality to the cost makes for an agreeable investment that is absolutely worth it. Excellent Sound Quality: As mentioned these wireless TV headphones are packed with a best-in-class Equalizer, which delivers crisp sound quality, regardless of the sound level at which the audio is being delivered. Multi-Device Switching: This feature allows you to stay connected with two devices at any given time. Suppose you’re enjoying a movie on your TV and get a call on your phone, the advanced technology on these headphones will pause the movie and give preference to the call. Easy Controls: Reaching out for the remote is a thing of the past. Need to increase or decrease the volume or even switch to the next scene? The easy control navigation buttons on the Bose TV headphones make it relatively easy to do. The Bose Sound Link II simply cannot be compared with any of the other headphones on our list, since the base technology that these headphones run on is completely different from the other wireless TV headphones. The Bose Sound Link II doesn't feature RF transmission and that is its plus point, allowing it easy connectivity to Smart TVs and other electronics that support Bluetooth. The Sound Link II features intense, immersive and improved EQ that all build up to a best-in-class performance. As mentioned, these TV headphones make it easy to switch between multiple connected devices such as your phone and your TV. The built-in microphone allows for easy calls on the go. The build quality of all Bose headphones are always top notch and the Sound Link II is no exception. The body of the headphones is solid, the ear cushions are extremely soft and the headphones, overall, are very lightweight. The headphones are also designed with impact-resistant material for better durability. The drivers on these headphones sport buttons that allow you to control volume, switch devices and play music on various Apple, Samsung and Android devices. There is also a connectivity icon and small LED to monitor the battery percentage. When it comes to the battery life of these headphones, while most Bluetooth headphones tend to have a battery life of between 10 - 13 hours, the Bose Sound Link has ventured ahead. You get an approximate battery life of around 2 hours on 15 minutes of charge and 15 hours of playback time on 3 hours of full charge. Now let's talk about the most important thing, the sound quality. If you’ve ever used Bose headphones in the past then you’ve certainly got great expectations. The sound quality and the bass level on the Sound Link II is pretty much perfect in every aspect. Unsurpassed Crisp Sound and excellent bass. Convenient Physical controls over drivers for seamless switching of devices. 15 hours of excellent battery life on 3 hours of charge. Extremely comfortable and one of the lightest headphones in the market. Premium and solid build quality. While the pricing on this headphone is a bit higher than average, coming from a leading brand, it is certainly justifiable. The headphones are packed with amazing, robust features including great bass and a best in the class equalizer. 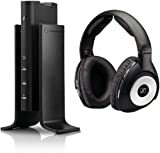 If you’re on the lookout for a multi-purpose pair of headphones to use with your TV as well as other Bluetooth enabled devices, then these would be an excellent choice. The Sennheiser SET820 TV headphones are a little bit different from what we have seen so far in the RS series from Sennheiser, the major difference being these are in-ear headphones. The headphones are ideally built for Home listening and can only be connected to RAC points with the help of an RF transmitter that comes with them. Ergonomic controls and quick visual response of operations makes this pair easy to use. The devices that are compatible with these headphones are TV, Hi-Fi system or Radio. RF wireless technology for robust connection. Connectivity range up to 100 feet. Uninterrupted wireless connection even through walls. Ergonomic controls and Visual Feedback. Lightweight and comfortable in-ear receiver. Since these headsets are slightly different from the RS series, we think a brief introduction is in order. Straight out of the box, you get a pair of headphones and a base. The battery on the headset is removable and is expected to last at least 9 hours. The battery can be charged by placing the headphone on the base. If you suspect you will be using the headphones for long hours or to if they are to be shared, you can always purchase another battery to keep charged as a spare. This way, you’ll rarely find yourself with a dead headset. The headphones come with an easy to understand user manual, which will help you hook up the headphones to your TV accurately. The connectivity, as expected, is excellent and the headphones offer a connectivity range of up to 100 feet, while the battery range is up to 9 hours on a single charge. Being in-ear headphones does make a very big impact on the overall weight and build of the headphones making them very comfortable to wear. The in-ear design also makes a big difference when it comes to audio experience. Unlike over-ear and on-ear headphones, these are fitted inside the ear, which leaves no room for an audio interception, and so no disturbance to surrounding people. Also, these can be ideal headphones for impaired people. The one thing that we didn't like about the SET840 TV headset is the battery range. Average battery range on a single charge is 9hrs, which isn’t the worst but is far from amazing with other TV headphones lasting up to 15-18 hours. However, if you are just a casual listener, then this shouldn’t pose any issue since it can last up to 3 days with casual use. High connectivity range of up to 100 feet. The SET840 are completely different from the RS Series or any other TV headphones in terms of design. They are in-ear lightweight headphones that offer up excellent features such as a high connectivity range, and ergonomic controls. The sound quality produced is amazing with absolutely no negative connotations in that aspect. If a high name brand is not an absolute must and you’re willing to trade name brand for amazing features, then these just might the headphones for you. These headphones from Avantree are by far the best Bluetooth headphones for the TV that you will find under the low budget segment. This claim does not arise simply due to the low price tag or simply great sound quality, instead, our conclusion is backed up by several other pointers which we are going to list below. These headphones from Avantree don't work on the RF technology, instead, they work on Bluetooth technology. This is great for TVs with built-in Bluetooth capability but what happens when your TV does not support Bluetooth? No worries! 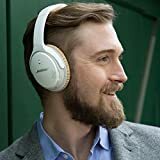 These headphones come with an Avantree transmitter that when plugged into a TV, converts that TV into a Bluetooth integrated device and creates a seamless wireless connection between the TV and the Avantree TV headphones. Seamless connection with the help of a Bluetooth transmitter. Ideal for devices with Analog output e.g. a TV with RAC output. Ideal for watching movies, videos and playing games. Up to 100 feet of insane wireless connectivity range. Insane battery life up to 40 hours. Fully compatible with Smartphones and Tablet. Comes with a 3.55 audio cable for direct plug and play in mobiles and Laptops. A few days ago, we did a roundup for the Best Wireless Headphones and the top contender was a pair of headphones from Avantree. Apart from the great sound quality, amazing wireless connectivity range, and other fantastic features, what really sold it and allowed it to gain the number one position was the insane battery life that it sported. Now the Avantree wireless TV headphones come with a battery range of approx 40 hours, which is absolutely insane and we can personally say that we’ve never seen that range in any other pair of headphones, be it TV headphones or normal wireless headphones. Now, while we won’t go quite as far as to say that the Bluetooth transmitter headphones are better than the traditional RF headphones for TV - RF headphones are the best technology you could ever have in any TV headphones, period! - but still, Bluetooth as a technology for TV headphones is pretty great. Especially on these headphones. Have you ever seen any Bluetooth headphones with a connectivity range of 100 feet? Well, we’ve got one for you right here. The Avantree TV headphones, despite running on wireless Bluetooth technology, has a connectivity range of up to 100 feet. The sound quality is amazing and the ear-cups are decently big enough to cover all sizes of ears comfortably. Also, since it runs on Bluetooth, you can create a direct connection to your cell phone, tablet or laptop. High connectivity of up to 100 feet. Excellent Battery range of 40 hours. Perfect for TV, Cell phones or any other device. Ideal TV headphones for gamers. 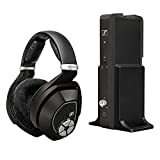 Do not think twice about getting these if you’re looking for a solid pair of headphones that not only work with the TV but also with other devices andcomes at a low budget! These wireless headphones from Avantree are absolute beasts and have all the essentials of a great set of headphones. The 40 hour battery life is something that cannot be found in any other TV headphones. As is apparent from this list, Sennheiser is by far the most popular brand when it comes to wireless TV headphones and it is absolutely ruling the market when it comes down to RF technology. The RS170 is a mid-priced headset with some great features like multi-receiver transmission and dynamic bass. Overall, these are the most power-packed TV wireless headphones by Sennheiser which we believe is definitely worth your time. The RS 170 features the Dynamic Bass Boost and Surround Sound simulation mode for the best music experience that can be turned on from the buttons provided on the headphones themselves. Up to 4 headphones multi-connectivity option. Closed back headphones with dynamic bass performance. Clear and Detailed Audio Reproduction. Multiple listening modes including surround sound. Included dock with the easy-charge cradle. Supports TV and other HiFi Audio devices like Home theatre system. Packed with a neodymium magnet for better sound clarity. Button Controls on top for Volume and to turn on surround and bass enhancer. Sennheiser headphones sometimes face a slight heating issue where they start to feel a little warm near the ears when used for long periods of time. While these headphones do have a little bit of heating, it is rare and only if used continuously for several hours. If, however, you use it in intervals, it shouldn’t be an issue. 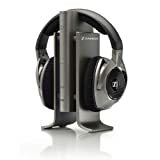 The Sennheiser RS170 are great TV headphones from Sennheiser. Talking about features, they come with multiple headphones connectivity option, where you can connect up to 4 headphones to the same audio source, be it a TV or a Home theatre system. We have seen similar headphones from the same brand with options of up to 2 headphones connectivity, but this one has taken it a step ahead. I hope you agree when we say that Bass is the most important part of any headphone, and in just RS 170, turning on the surround and Bass have been made extremely easy with the physical buttons on top. The driver also includes separate buttons for volume controls. With the use of neodymium ferrous magnet, the manufacturer has focused primarily on clear sound reproduction so you don’t have to compromise on audio clarity. The design does not differ much from RS 180 but is quite different when compared to other headphones from the series. The overall weight of these wireless TV headphones is just 216gms, which is an excellent thing. Similar to Rs 160 and Rs 180, these headphones also have the Kleer audio technology integrated in them which offers loss-free audio reception at up to 260 feet. Kleer technology is built in a way that doesn't interfere with any other wireless technology or 2.4Ghz technology. Multi-receiver transmission allowing up to 4 headphones connectivity. Easy to switch surround sound and dynamic bass modes. Closed back design with detailed audio reproduction. Lightweight and premium overall design. Minor heating of drivers after continuous use for a couple of hours. Control buttons are difficult to discern. If you have a mid-budget and want a transmitter which can be used by your entire family at the same time, then you can and should give this a chance. It also comes with special add-ons like Neodiym ferrous magnet and Kleer audio technology, which will take your overall audio listening experience to the next level. The Sennheiser RS180 are completely different headphones as compared to the RS185. They have integrated Kleer technology, which isn’t present on the RS185. They sport an open back classy, build which are definite eye candy. The headphone works on the same RF technology as any of the other RS headphones that makes them compatible with all devices featuring Analog and RAC inputs. The RS180 headphones are absolutely built to delight. The shiny smooth metal finish certainly catches the eye. Open circumaural design with Kleer’s Uncompressed audio transmission. Up to 4 headphones multi-connectivity from the same source. Easy Charge cradle and Docking Station. Clear and Detailed Audio Reproduction from Dynamic design. Up to 320 feet of connectivity range. 32 ohms of independence level. 24 hours battery range on a single charge. Minimal weight of 216 grams. These amazing features are sure to wow even non-audiophiles. Great Sound, multiple headphones connectivity, and a high connectivity range, these headphones have pretty much everything going for them. One of the biggest issues that wireless headphones encounter is transmittance with other wireless devices at 2.4GHZ. Luckily Sennheiser has come with a fantastic solution to this with its Kleer technology. The technology not only allows automatic pairing but also allows multiple connections of wireless headphones [up to 4 devices] to the same base station, so, for example, a family of 4 can enjoy the same TV show together. The RS180 comes equipped with a bigger battery - meaning better battery life - that performs very well. The headphone features an open back design, unlike other Sennheiser TV headphones, giving it that extra nudge over the other models. It only comes with the standard audio jack of 3.5mm and no 6.3mm jack, unlike other TV headphones. It also comes equipped with automatic level control for the optimum sound level so you never have to worry about sudden, loud audio sounds. We absolutely love the design of these headphones. The manufacturers have used a perfect combination of metal and premium plastic that not only makes it look good but also makes it durable at the same time. On the headband and the ear-cups, you will find luxury cushion padding that offers excellent comfort and feel. As mentioned above, you also have the option to connect up to a maximum of 4 headphones to the same source. The open-back design on the RS180 delivers the most natural sounds to your ears. A detailed, full-bodied sound is pumped into the ears of the user, filling the ear-cups with extremely smooth audio. And finally, last but not least, the audio and bass performance is excellent and clear, plus with the 320 feet of connectivity range, you will never notice any interference issues even if you move around your house. Multi-receiver transmission for up to 4 device connectivity. Excellent and premium design along with great comfort quality. Long Battery life of up to one whole day. Can be slightly uncomfortable when used continously for long hours. The RS180 does certainly provide tough competition to other Sennheiser TV headphones from the same series with Kleer audio technology. If you are an audiophile and are on the search for a pair of open-back TV headsets then these are the ones. Though they may be lacking in technical innovation when compared to similar headphones from Sennheiser, they simply beat all the other TV headphones when it comes to design. According to the company TV Ears, these headphones are recommended by Doctors and have helped millions of people hear better audio quality without any complaints of loud volume or the need to buy any type of hearing aids. These headphones are very similar to the one from Simolio, despite the fact that they run on a different technology. With that said, let's have a look at all the features of these headphones. Exclusive Speed of Light Infrared Technology. Twice the maximum volume as compared to other headsets. The frequency response of 20 – 20,000 Hz. The TV Ears Original Wireless headphones are a solid pair of headphones with exclusive technology build especially keeping hearing impaired people in mind. Headphones from TV Ears come with their proprietary voice clarifying circuitry that automatically balances the audio curve to enhance the quality of television audio and decrease the volume of all background sounds such as music. This allows words and speech to stand out, making even quiet whispers audible. 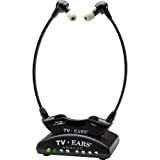 TV Ears headphones use SoLIT (Speed of light infrared technology) to send audio over to the headphones from transmitters, which is comparably faster than both Bluetooth and RF technology. With the tech like dialogue sound enhancement, TV Ears headphones have twice the power when compared to other headphones, that results in the twice the maximum volume. Although they are ultra-lightweight, they are not the most comfortable pair of headphones around. Integrated Speed of Light Infrared Technology. Functionality to a mute TV. Not the most comfortable build. We would probably only suggest these headphones if you are buying them for someone who is hearing impaired. They are specially built for people who have a problem with hearing and works just fine for that cause. Apart from this, they do not sport any special or unique features and there’s not much else to talk about. If you do not face hearing issues, then it wouldn’t make much sense to get these headphones. Next up are the wireless headsets from Simolio. Though not a very popular pair among customers, they are a really a good choice for audio; something that is an absolute value for money. The headsets from Simolio work on quite a different technology as compared to other headphones/headsets, and as stated by the manufacturer, this technology is better than the normal RS, and 2.4 GHz technology. 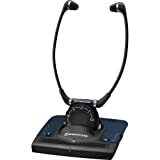 The technology integrated into these Simolio headsets is referred to as 2.4 GHz digital FHSS (Frequency hopping spread spectrum), and is completely free of any kind of interruption, providing great connectivity range. Integrated inside is the most advanced 2.4 GHz Digital FHSS (Frequency- Hopping – Speed – Spectrum) tech. Interruption-free connectivity range up to 100 feet. Auto signal control to balance sudden spikes in volume. Comes with built-in-mic to amplify conversations with people nearby. Very Helpful for hearing impaired people. Auto power off when idle for 3 minutes. Up to 7 hours of battery range. These headphones from Simolio have got so much going on for them! They combine great audio quality and advanced audio balance with excellent connectivity range making for a pair of headphones with barely any negatives to talk about. The Simolio TV headphones are compatible with any device that comes with analog RCA Audio Outputs. Again, talking about the latest 2.GHz Digital FHSS technology, these headphones produce excellent sound, don't need any frequency modulation to avoid noises, face no audio-sync delay or audio interruption, etc. Sudden loud sounds or jerks on the screen can lead to annoying and painful hits of sound to the ears. With the Simolio TV headphones, you don't have to worry about that at all as it comes with an auto signal control which automatically balances the sound whenever there is a sudden kind of bump. The battery, when compared to other TV headphones, is not the greatest and lasts only for 7 hours, but the good thing about these is that they come with an auto power off feature that turns off the headphones if they are idle for 3 minutes. The headphones come with features to switch the wireless headphones to a personal sound amplifier by pressing the mic button which could be an extremely helpful feature for anyone who is hearing impaired. You can press mic again to switch back to the TV. Advanced 2.4GHz digital automatic FHSS. The auto sound balance system. Up to 100 feet of connectivity range. The headphones are pretty good in terms of sound quality and with the new connectivity technology, you will get interruption free connectivity. Though the battery life is quite low when compared to other TV headphones, considering the price you pay, they are a pretty good choice. Wireless TV Headphones are not a whole lot different when compared to other wireless headphones, they just run on a different sort of technology. TV headphones come with an analog transmitter that needs to be connected to the TV before you can enjoy listening to them. However, you do get TV headphones that use Bluetooth and are super easy to connect and usually come at a lower price. However, Bluetooth headphones have their own share of drawbacks due to the lower frequency range that results in the breakdown of sounds at intervals whereas transmitter based headphones have an average range of 100 meters. Wireless Vs Wired: Which Type of Headphones are Better? Except for the obvious difference that is the cable, there are several other differences between them. Although ultimately, it depends on your needs, we are going to list all the major differences below for your consideration. In general, we believe that when it comes to buying headphones for TV, it doesn’t make a lot of sense to get the wired kind. TV is usually enjoyed from a distance thus making a wired headphone pretty annoying to deal with. Sound Quality: From what we have observed so far, wired headphones in most cases are better than wireless ones in terms of sound quality. The differences though are tiny and only a true audio aficionado would be able to pick out on those differences. Layman users would not particularly notice them. Back in the day, there was definitely a more discernible difference between wired and wireless headphones, but thanks to big brands like Sennheiser and Sony, there is hardly any difference in sound quality now. Furthermore, in some cases, you will find that wireless headphones are better than the wired ones. Battery Life: It's obvious that wired headphones don't need a battery to work, which means you can use them for as much time as you want, whenever and wherever. Wireless headphones, on the other hand, require a battery which needs to be charged at regular intervals. But, keep in mind, most wireless headphones today come with a battery life of approx. 12-20 hours making them pretty great for daily use. Price: Now this is something a lot of people can agree upon. Wireless headphones surely are more expensive than the wired kind. A pair of good wired headphones can be bought for under $100, while a pair of good wireless headphones would cost you around $150 - $200 and even more than that in some cases. 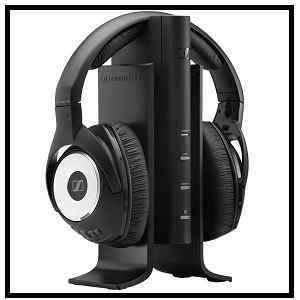 In general, when it comes to wireless headphones, Bluetooth technology is most commonly used. But, things are different in case of wireless headphones specifically for TV. The Most popular and best TV headphones use RF technology for connectivity and that's because with RF there is no interference issue, you get a long connectivity range and with some TV headphones, the RF signals easily pass through the walls. 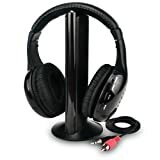 Most wireless headphones for a TV that come with base stations work on RF technology rather than infrared or Bluetooth. The reason being RF offers better connectivity range. Most of the RF headphones mentioned on our list do have a connectivity range up to 100 meters or 300 feet making them the best option to go with. With wireless technology, audio interference is a very common issue which leads to sound cuts and similar audio issues. Some headphones may have a better connection when compared to other. Some headphones are louder but not loud enough to block surrounding sounds and that's why we recommend reading carefully precisely through their review before you decide on a headset. Battery life is an important issue for any wireless device. Higher quality headphones provide 20 or more hours of wireless listening and these are the headphones we would generally recommend. Luckily, on our list, most of the recommended TV headphones do come with a battery life of more than 20 hours and a few with a battery life of 15 hours+ which is great backup time for any TV headphones. Comfort is an important deciding factor to point out here as you do generally wear your headphones for no less than 30 minutes at a time and if they aren’t soft and cushy and/or if they are heavy then it would lead to an unpleasant experience. So watch out for the overall build of the headphones. When using headphones, are others in the room able to hear the tv at a normal sound level? My husband needs headphones to watch tv so he does not blast the rest of us out of room. There would be very less sound leakage from these headphones, which would not cause any disturbance to other people in the room.